I finally tried Stitch Fix Kids for Dessa! 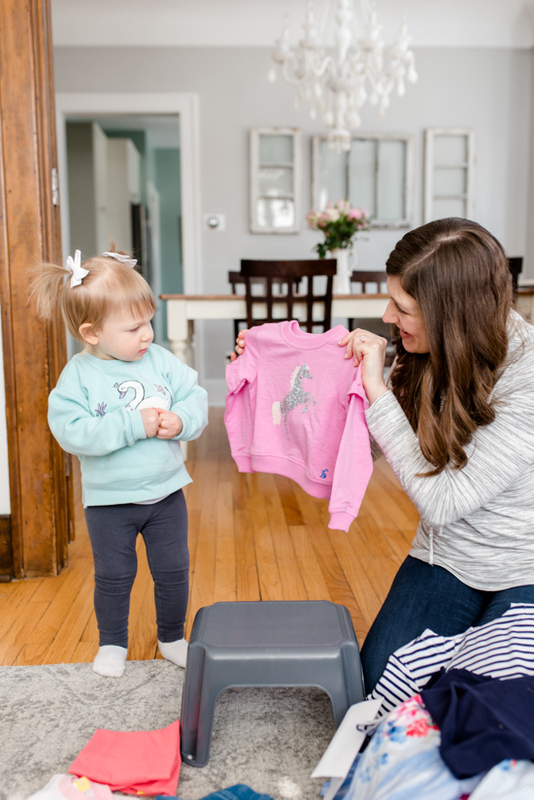 You already know how much Rob and I love using Stitch Fix to shop for clothes, and several readers have asked if we would try Stitch Fix Kids for Dessa since the service expanded to children's clothes last July. 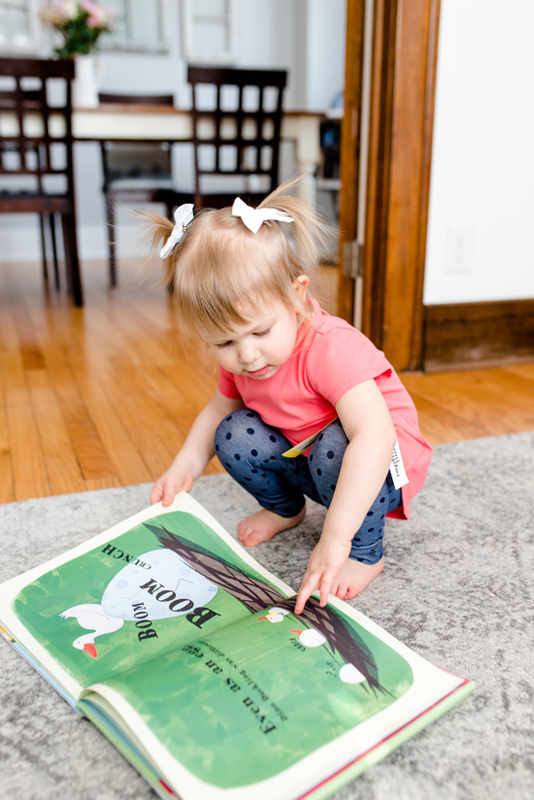 With spring just around the corner and Dessa's wardrobe in need of a serious refresh, this seemed like the perfect time to finally give Stitch Fix Kids a try and I can't wait to tell you all about our experience. This post contains affiliate links. 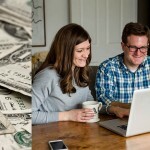 We receive a small commission each time someone makes a purchase or signs up for Stitch Fix through one of our links, which helps to support the blog and our family. 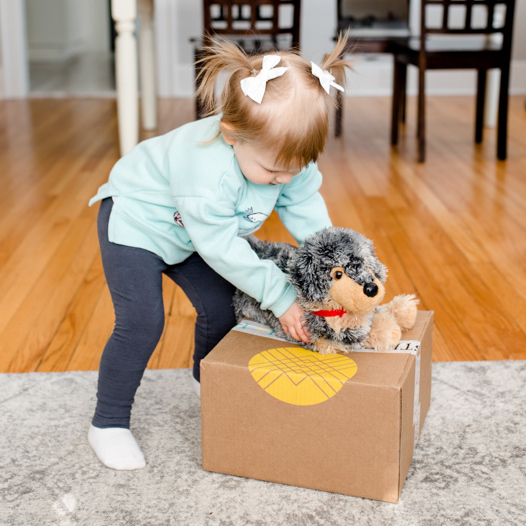 Parents who want to place an order with Stitch Fix Kids can add a separate kid profile onto his or her existing account (up to four children can be added to a parent's account). This creates a family account and it is super-easy to switch profiles and manage multiple members of the family under the family account. 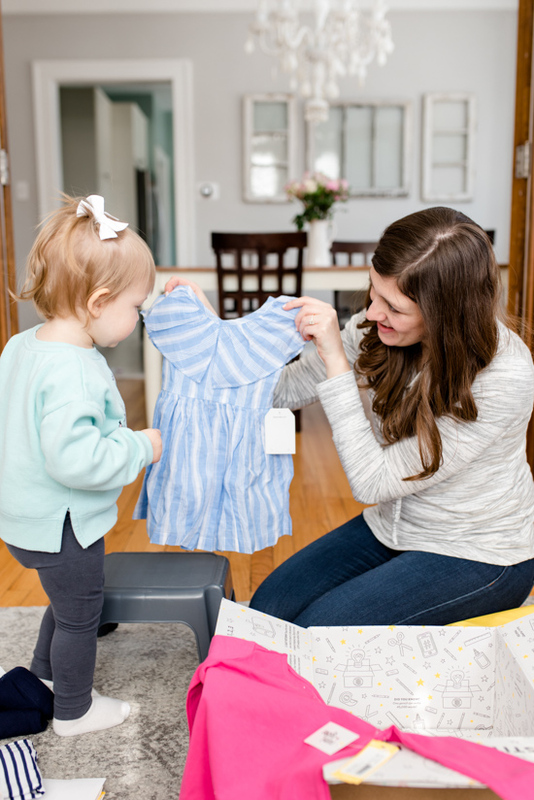 Unlike adult fixes, which deliver 5 items per fix (with the option of adding “extras”), Stitch Fix Kids customers receive 8-12 items in a Fix. 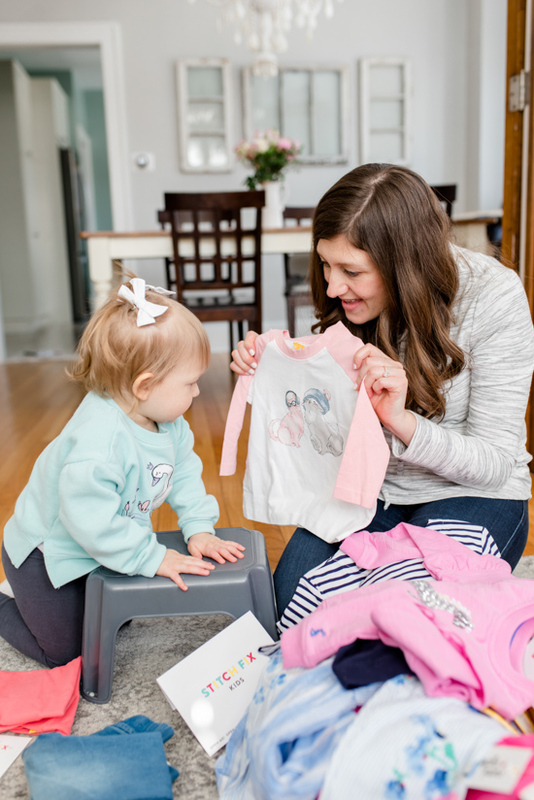 Popular brands such as Under Armour, Nike, TOMS, DL1961, Hanna Andersson, Threads 4 Thought, Joules, Sovereign Code and Tailor Vintage are available through Stitch Fix Kids, as well as the exclusive in-house brand, Rumi + Ryder. 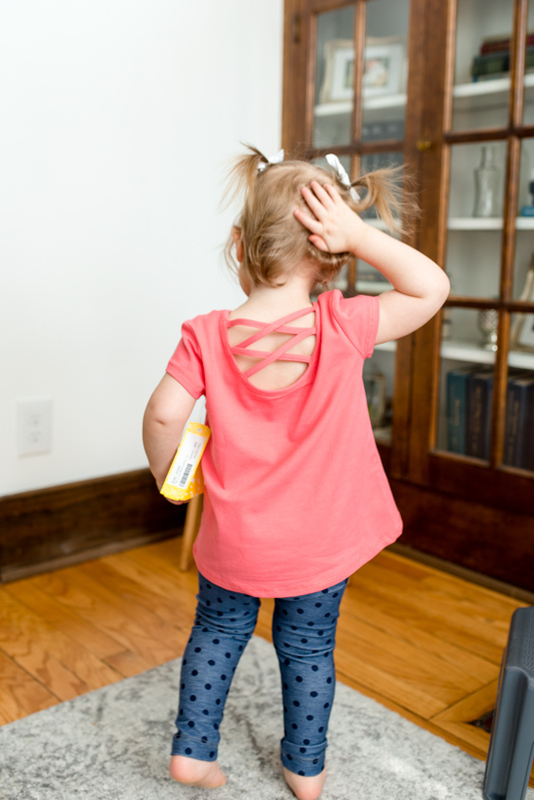 Just like adult Fixes, Stitch Fix Kids clients pay a $20 styling fee, which is automatically applied toward any items purchased from the Fix. Purchase the items you love and send back the rest, with free shipping both ways. Best of all, you can enjoy a 25% discount if you choose to purchase everything from your child's Fix. It's worth noting that Stitch Fix Style Pass memberships do not apply toward children's fixes. I was lucky to be randomly invited to join Style Pass last year (which waives the styling fee on all of my fixes), but I still had to pay the $20 fee for Dessa's shipment from Stitch Fix Kids. 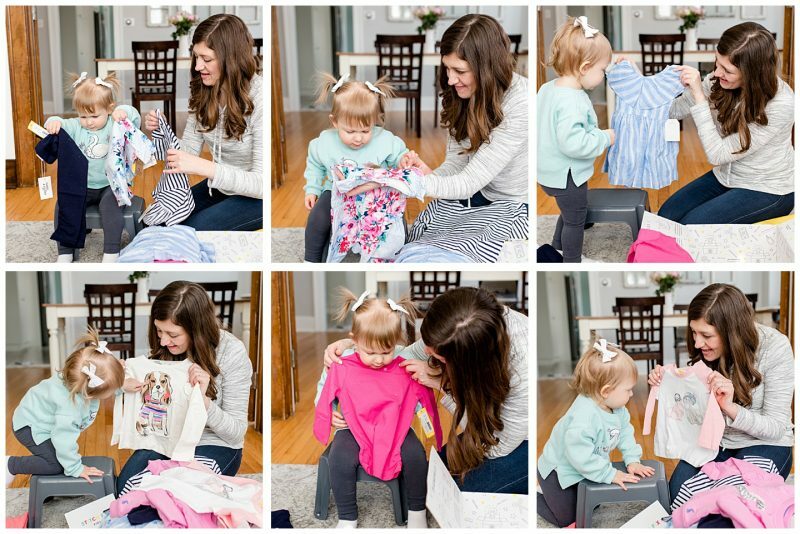 Before I dive into Dessa's Stitch Fix Kids try-on, you really need to understand a few things about how I shop for her clothes. My rule for purchasing clothes for myself or Dessa is that I only spend money on clothes that I absolutely love. 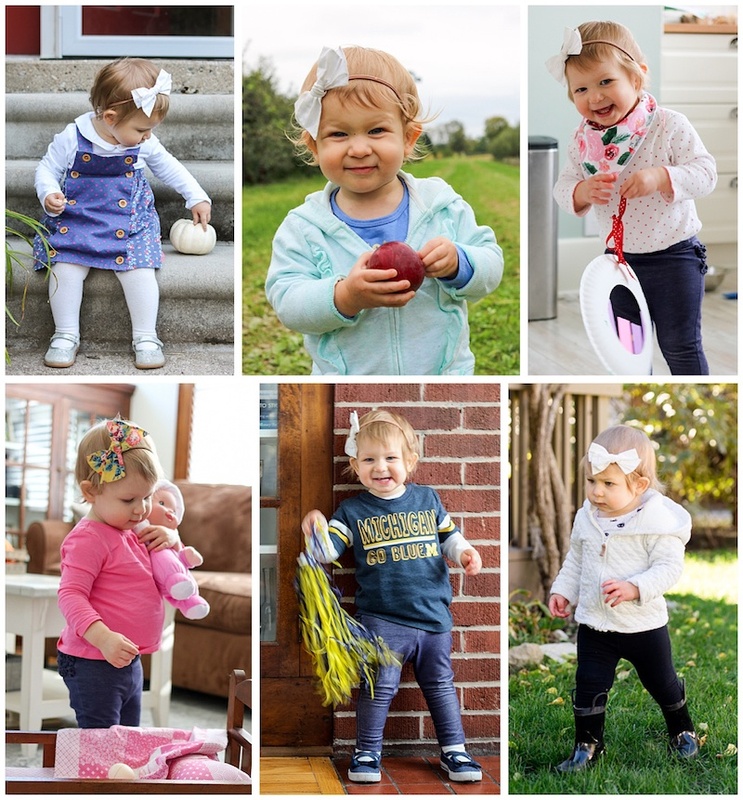 So what exactly do I love when it comes to dressing my twenty-month-old? I like dressing Dessa in basic pieces with a few special details. Graphic tees are ok, but I'm super picky and generally only like her to wear them for everyday play (not so much when we are visiting with friends and family). Most importantly, I like to dress Dessa like the little girl that she is. No need to speed up the clock with fancy details and grown-up trends (like cold shoulder or cutouts). Dessa is little and sweet and I want her attire to reflect her youth and innocence. As for the price of Dessa's clothes, I enjoy a bargain as much as the next girl. You may recall from our most recent budget-related post that I get most of Dessa's wardrobe from Carters or Old Navy when they have a good sale and I can take 40-50% off the original price. As much as low prices always make me happy, I'm also willing to splurge up to $50 on special pieces (I have a soft spot for Matilda Jane dresses). Price isn't my only driving force when I purchase clothes for Dessa, but it is a significant consideration that I take into account. With a new season on the horizon, I was finally ready to give Stitch Fix Kids a try. I created a kids profile in my account for Dessa and was so excited to see what came our way. Dessa LOVES helping me open packages that arrive in the mail and she eagerly helped me dig in to see what arrived in her very first Stitch Fix shipment. You can tell right away that the packaging for a kids shipment is very similar to a grown-up Fix. Dessa's Fix came with her clothes wrapped into two neat little paper “burritos” with an envelope that included everything I needed to know about her fix (style cards, prices, and all!) I also love that Stitch Fix included a sheet of cute little stickers for Dessa to play with. Dessa loved going through the entire box to discover every itty bitty item included in her shipment. 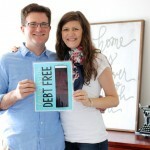 At last, it was time to see what Dessa's stylist sent her way! I had requested basic pieces for play, as well as a few nicer tops or dresses that she could wear for special occasions. I showed Dessa all of the clothes in her Stitch Fix box and it was so cute to watch her check them all out. 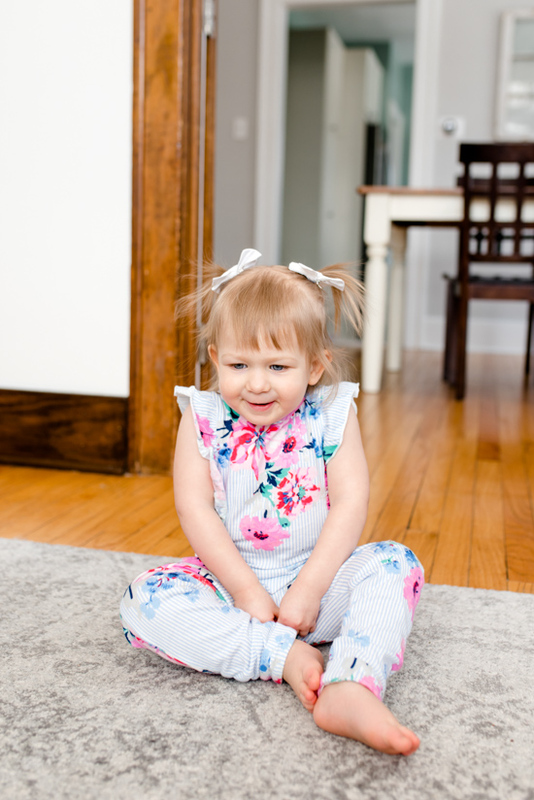 Dessa doesn't exactly enjoy changing her clothes, and I wasn't very sure how the rest of our little Stitch Fix Kids preview would go. I hoped that she would cooperate enough to try on one or two items without a fight and she blew me away by happily trying on seven of the ten items that came in her fix. She loves my photographer Erika, and I think she ate up all of the special attention she received each time she tried on a new item of clothing. Here's what came our way in Dessa's first box from Stitch Fix Kids, along with my very honest, very picky opinion about each piece. The Tiana Frill Sleeve Sweatshirt from Joules ($30), was a lot fancier than the name implies. Along with the ruffles on the sleeves, the pink sweatshirt also had an adorable sequin unicorn on the front. Dessa loves anything shiny so I used this shirt to draw her in and put her in the right mood for trying on clothes from her Stitch Fix Kids box. It worked! Dessa loved the unicorn sweatshirt and I had to admit that it looked so stinkin' cute on her. This wasn't a practical item for me to keep, though. Dessa is very warm blooded and is usually perfectly comfortable in a regular long-sleeve shirt. We have a few sweatshirts in the rotation and I couldn't justify a $30 expense for a sweatshirt that wouldn't be worn very often. The Tiana Frill Sleeve Sweatshirt really was so cute, though, and it certainly put Dessa in the mood for trying on more clothes. Dessa adores dogs and her stylist sent The Long Sleeve Ruffle Tee from RUMI + RYDER ($20) with a watercolor dog image. 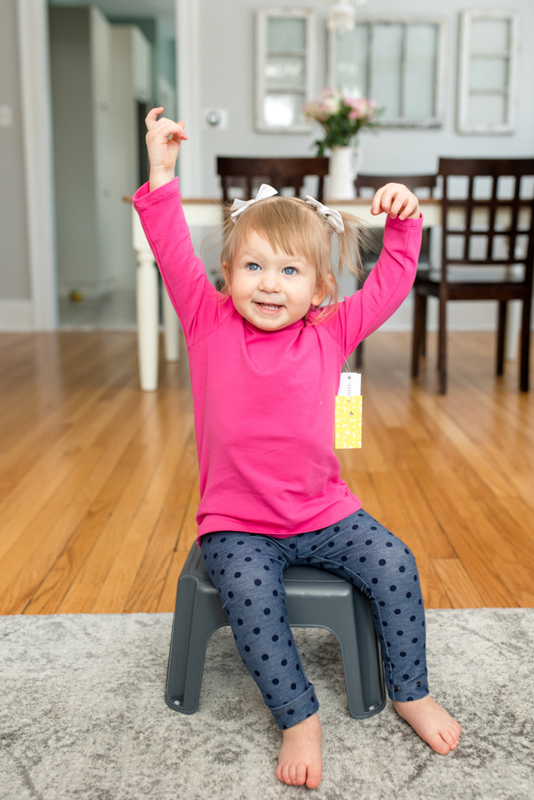 This was the second item Dessa tried on from her Stitch Fix Kids shipment and, of course, she loved it! Dessa was especially fascinated by the little three-dimensional flower embellishments. The top was very cute, but I didn't absolutely love it. I thought the color washed Dessa out, the top was too big around the neck, and I really don't love graphic print shirts. I'll buy them for Dessa occasionally, but usually only if I can get them on sale for $5 or less. And this $20 Long Sleeve Ruffle Tee definitely wasn't priced at $5, which meant that it was going back. If I were a little less picky or had a little extra spending money, I would have been more inclined to keep the top and I definitely debated long and hard before finally deciding to return it to Stitch Fix. The next item Dessa tried on The Cross Back Swing Top from RUMI + RYDER ($16) in a really pretty coral color. The Cross Back Swing Top was a perfect fit and I love that we were sent a cute versatile top in a bright solid color. 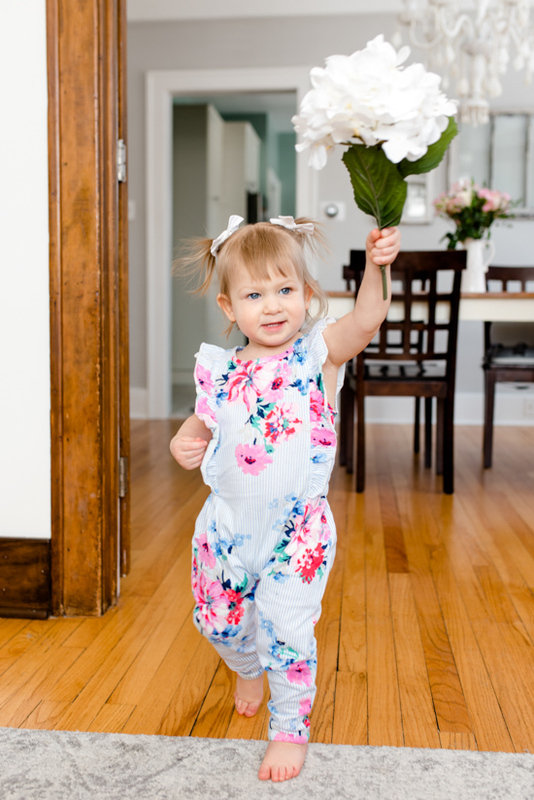 I love dressing Dessa in classic solid colors because they are so easy to mix, match and help us maintain a minimal capsule-style wardrobe for her. As the name suggests, the back of The Cross Back Swing Top had a scoop back with criss-cross details. The look is definitely fitting with current trends for women's fashions (and I'm sure clothing trends for kids as well), but the cross detail was actually the reason I decided to return the top. Dessa is still very young and the cross back detail just felt too grown up for my sweet little girl. I'm not in any hurry for her to grow up and (or dress like a mini grown up). If you're like me and love solid, basic tees with just a touch of extra detail to make it feel special, you may want to check out the short sleeve hi-lo tees at Carters. These have become a staple in Dessa's wardrobe. When the cross back tee wasn't a good match for Dessa's style, I was happy to see another bright colored solid top in her Fix. The Side Ruched Top from RUMI + RYDER ($18) was a bright pink long sleeve top with sweet little ruching details on the sleeves. Dessa had a similar bright pink long sleeve top that I purchased from Carter's last year and adored on her. Carter's hasn't had any basic long-sleeve toddler tees in stock for months (but they do have them for babies and big kids), so this was a welcome alternative to my favorite solid tee for Dessa. The Side Ruched Top was a bit pricier than I usually pay for a basic long sleeve top, but I had already paid for my styling fee and was out $20, so I didn't mind keeping this one to defray the cost. Our little at-home try-on session continued with a navy and white striped Ruffle Sleeve Button Back Top from RUMI + RYDER ($18). I liked the classic color combination of crisp navy and white and this was such a fun top for spring. The Ruffle Sleeve Button Back Top fit Dessa exactly the way it was intended. I personally didn't love the bell sleeves on her. Again, I'm a traditionalist for toddler clothes and would have preferred a simple or short sleeve instead, so this one was going back. Dessa's stylist also sent the Kristin Knit Jumpsuit from Joules ($30) in a beautiful floral print. I don't care for jumpsuits and Rob really doesn't like the style of them, so I knew this one was going back to Stitch Fix right from the start. If Rob didn't have such a strong opinion, I would have considered keeping it just because the Kristin Knit Jumpsuit fit Dessa so incredibly well and I was in love with the print. I'm going to cross my fingers and hope that I can get a dress in this beautiful print for Dessa one day because I would buy it in a heartbeat. 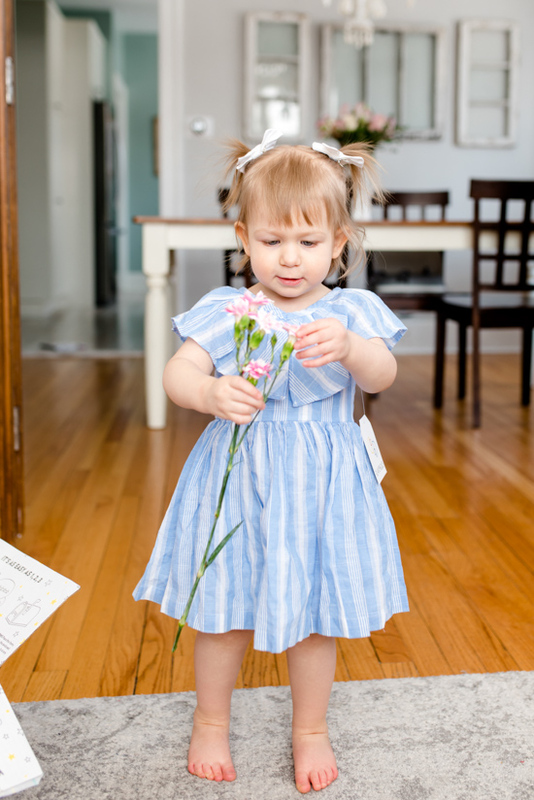 Speaking of dresses, Dessa did receive one in her first shipment from Stitch Fix Kids. It was a light blue and white Mauvie Ruffle Collar Dress from Flapdoodles ($30) that is perfect for spring. I was impressed by how well the dress fit, but still left room for her to grow and the soft blue print was oh-so-sweet and perfectly classic. The only thing I didn't care for was the size of the ruffle across the top. It was a whole lotta ruffle and I would have preferred a smaller-scale ruffle detail. Since I didn't absolutely adore the dress, I decided to send it back to Stitch Fix, but this was a tough one to say goodbye to. 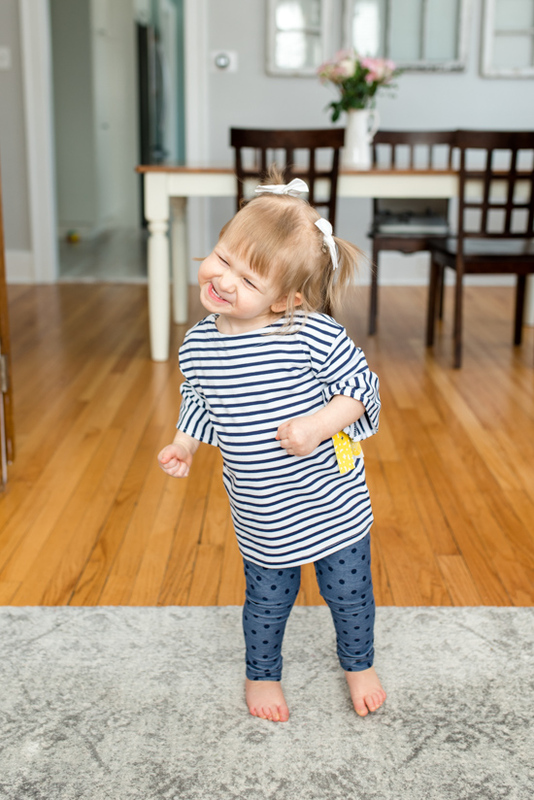 As good-natured as Dessa was during our little Stitch Fix Kids try-on session, even she had her limits. There were three items Dessa didn't have a chance to try on that day, but she did try two of them on later on and I can let you know how it went. The Bridget Knit Skinny Jean from Studio V ($20) was a very cute pair of toddler jeans. The only jeans Dessa has ever owned are basic stretch leggings from Old Navy, which I have always been happy with. The fit was off for this particular pair of pants (they were a little too long and way too big around the waist for Dessa) but I am now convinced that a cute little pair of jeans would be a great addition to Dessa's wardrobe. Dessa never did try on the Rylie Graphic Baseball Tee from Tailor Vintage ($14). It was cute enough, but I didn't absolutely love the top so I ended up sending it back. I don't have any photos of the navy Nora Ruched Ankle Legging from RUMI + RYDER ($12), but they were a cute, basic pair of leggings with a tiny bit of ruching detail above the ankles. Dessa's wardrobe was already well-stocked with multiple pairs of leggings that I got on sale this season from Old Navy, so we just weren't in the market for another pair. This pair went back to Stitch Fix. 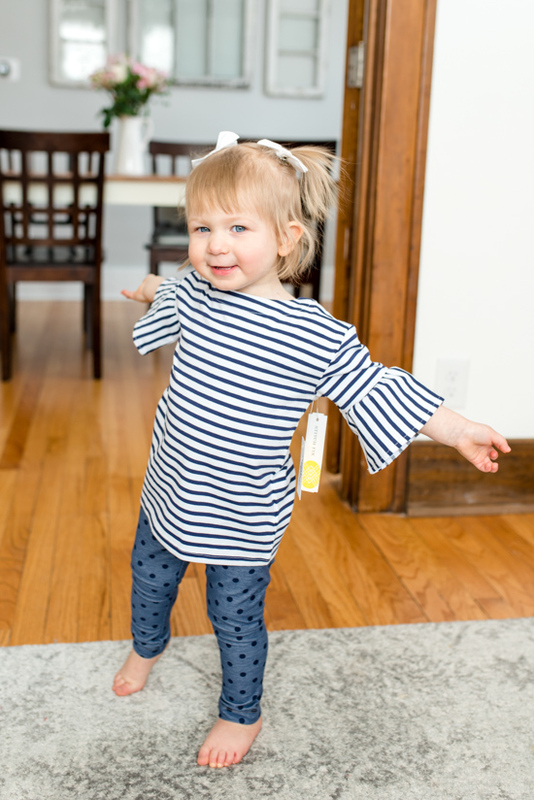 If you've been keeping track throughout the review, you already know that we only decided to keep one item from Dessa's first shipment from Stitch Fix Kids. It's not that I didn't like the clothes that came our way, but it did cost more than I usually pay for toddler clothes and the clothes that I did like weren't loved enough to justify the extra expense. The shirt I kept only cost $18, which was covered by the $20 styling fee, and I was out $2, but I preferred to lose $2 than pay extra for a piece of clothing that I didn't really love. 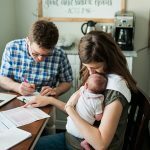 I realize that I only kept one item from Dessa's Stitch Fix Kids shipment, and I know that I didn't exactly love everything that came her way, but that doesn't mean that I hated the experience or regretted spending the money. Dessa had a ton of fun opening her Stitch Fix box and I have been curious about Stitch Fix Kids ever since it launched last summer. At the end of the day, I just like to dress Dessa in very simple, basic clothes, which doesn't seem to be what Stitch Fix Kids specializes in. I've known all along that I'm a picky customer for kids clothes so I'm not entirely surprised that I wasn't breaking my budget this month trying to find a way to afford all of these toddler clothes. I don't envision myself using the service often, but I'm sure that I will give it another try at some point in the future. I think Stitch Fix Kids would be a better fit for moms with a bigger clothing budget, for parents who like designer clothing for their children, or for kids who like to dress on-trend (especially older kids). 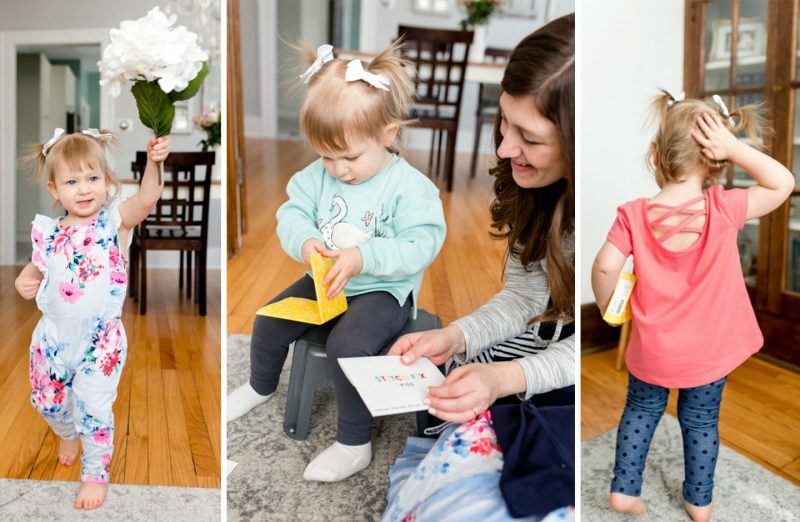 A huge thank you to our photographer, ErikaErika for patiently capturing so many wonderful photos from our Stitch Fix Kids try-on and entertaining Dessa along the way. I would add that Stitch Fix kids is great for parents with picky kids or kids who hate shopping. Getting my 9 year old son to pick out what he likes in a store means that he has 10 of the exact same shirt. Stitch Fix has been amazing to get him to try something that is close to what he likes but also a little new. Plus no dressing room! Also, I would recommend for body conscious teens, especially when they get to the age where nothing seems to fit right. Hi Sam, thank you so much for the insightful comment! We are far from that stage of life, but you make so many good points about how Stitch Fix Kids could be a great experience for older children. And as far as owning 10 of the exact same shirt, I noticed when I checked out that I could request similar tops in different colors for many of the items that Dessa received, which could be helpful to a lot of parents (and picky kids) as well. My 12 year old daughter just received her 3rd fix and it’s been a great experience. Like others stated, it is perfect for picky kids!! We asked for dresses for band/music concerts and received several to choose from and 1 worked! We also asked for jean shorts (adjustable waist, not too short, frayed edges) and 2 out of 3 pairs worked. When my kids were little, I agree that Carters/Gap/Old Navy sales were the way to shop. But now, I’ll happily pay to have hard-to-find items shipped right to me. Hi Carissa, I think you nailed my issue exactly on the head. It’s probably an age thing. 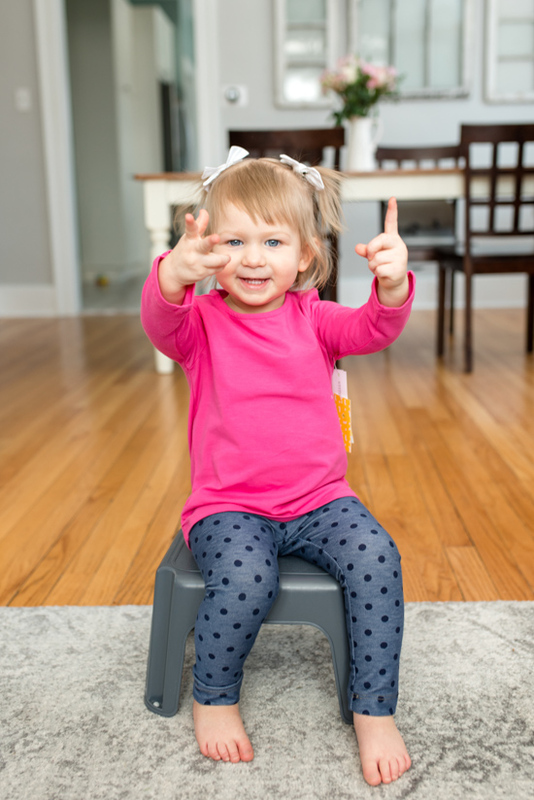 Toddlers are pretty easy and cheap to dress, but big kids can certainly be more complicated. I have a feeling that Stitch Fix Kids SHINES for older kids. 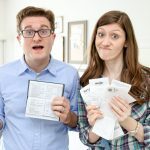 Beautiful photos and fun Fix! I scheduled a Mommy and Me Fix for my daughter and I. But her Fix was late. We didn’t get pictures together. She loved the experience also. She’s now 11, and quite particular about her clothes. It was fun for her to get some on trend styles that I may not normally allow 😀 Although it was harder to get her to send them back once they were in her possession. I love the style pass, and hope they offer something similar for kids. I’d been curious to see what they send for kids. I have two young boys but feel like I’m too picky to get them a fix. I get most of their clothes from Primary and Target right now but could see how it could be fun for my 6 year old. 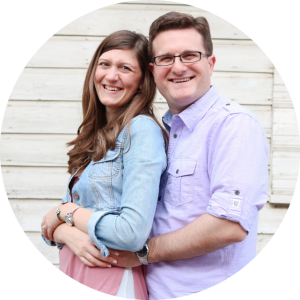 They both enjoy Mom and Dad’s “try on show” from Stitch Fix. 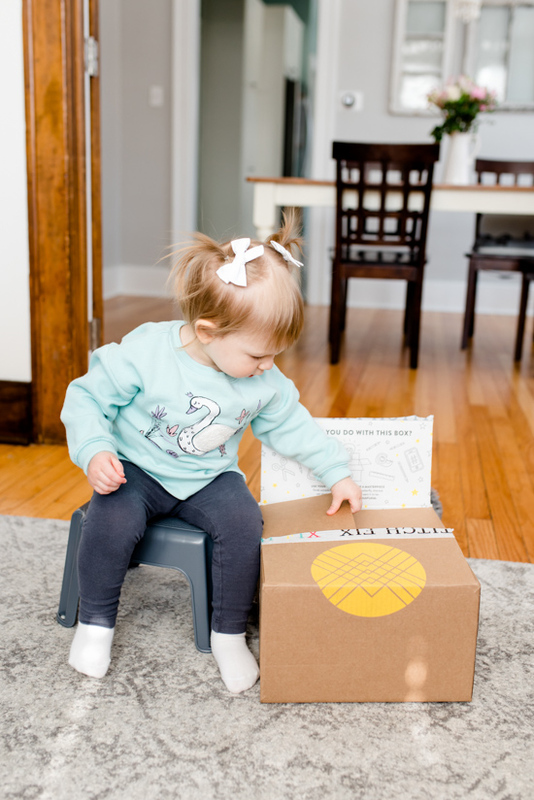 Were you able to view your stitch fix kids box once it shipped (same as the adult sneak peak)? Hi Jenna! That’s a great question and YES! I could see all of Dessa’s clothes online and in the Stitch Fix App on my phone as soon as they had shipped. 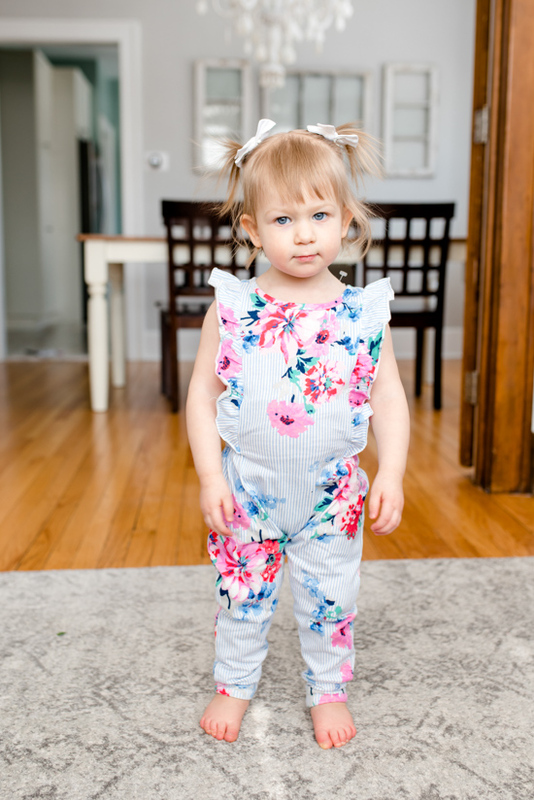 Thank you so much for sharing the cute things Dessa got in her fix. I love your insightful and thoughtful review of the pieces she received just like you do with your pieces from Stitch Fix. My babies are grown adults so I have no reason to get a kids fix so it is fun to see what they send for kids. Maybe grand-kids one day but for now I can enjoy your lovely review. Hi Kay and thank you SO much for your sweet comment! It really was fun just to have my curiosity satisfied about the service and I’m happy to hear that you enjoyed reading about it. Here’s hoping for grandkids one day! I don’t think I’d be willing to pay those prices for toddler clothes either! Especially when they outgrow them so quickly! Unless there was something absolutely adorable that was worth the splurge! Interesting that you can’t use your style pass for kids. Wonder if there’s an option to purchase an additional style pass for kids if you do like the service? (Hopefully for a lower price!) 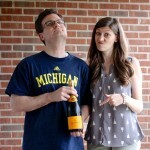 You didn’t mention Stitchfix credit. 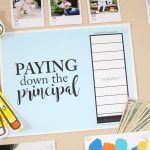 If you have a credit balance from referral credit can it be used for kids? Hi Megan and YES about the credit! I have some credit in my Stitch Fix account and I was able to use that to pay for Dessa’s styling fee and clothes just as if they were my clothes. Great question!